Citation: Farrell M, Dhume M, Fisher CL, et al. Massive right-sided hiatal hernia variation. Int J Anat Var. Mar 2019;12(1):013-014. During routine cadaver dissection for academic purposes, a massive hiatal hernia was identified in an 84- year-old female cadaver. A herniation of abdominal contents was displaced into the right thoracic cavity, which contained the entire stomach, pyloric sphincter and portions of the greater and lesser omentums. Prior to death, there were no reports of significant functional abnormalities, although there were reports of gastrointestinal bleeding. This case presents a rare variant due to two factors: the size of the esophageal hiatus and the displacement of the hernia into the right side of the thoracic cavity. The hiatal surface area (HSA) in this case report was calculated to be almost three times the established average HSA in normal patients. The majority of reported paraesophageal hernias (PEH) are left-sided with little mention of right-sided PEH in the literature. This case report attempts to add to the body of literature detailing right-sided hiatal hernias. The esophageal hiatus is an opening in the diaphragm at the T10 vertebral level that allows the esophagus and the vagal trunks to pass into the abdominal cavity of the human body. A hiatal hernia describes a herniation of abdominal contents, typically the stomach, through this hiatus into the mediastinum. Classically, there are four types of hiatal hernias. Type I is described as the sliding hiatal hernia, while types II-IV are considered paraesophageal hernias (PEH). The sliding hiatal hernia is characterized by displacement of the gastroesophageal junction (GEJ) superiorly and portions of the gastric cardia herniating into the posterior mediastinum . According to Watson (2018), 95% of hiatal hernias are classified as sliding hiatal hernias, leaving 5% under type II-IV classifications. Type II herniation presents with the GEJ in normal anatomic position, but with a gastric fundus herniation . Type III hiatal hernias have a superiorly displaced GEJ, similar to the sliding hernia, and a large herniation of the stomach, similarly to Type II. Lastly, Type IV hernias also have a superiorly displaced GEJ in addition to herniation of other organs along with the stomach through the esophageal hiatus. Most commonly, the colon herniates with the stomach in Type IV hernias, but other organs may consist of the spleen, pancreas or small intestines [1,2]. The reason for development of paraesophageal hernias are not clear, but it is thought that increased age and intra-abdominal pressure could contribute to the laxity of the external sphincter of the esophagogastric junction. That laxity could allow abdominal contents to rise superiorly into the thoracic cavity. Hiatal hernias can present acute symptoms such as obstructions, which can lead to serious complications of bleeding, ischemia, perforation and sepsis . Many chronic clinical manifestations can also result from a large hiatal hernia including dysphagia, nausea, vomiting, regurgitation, heartburn, ulcers, anemia, poor emptying, and/or shortness of breath . Patients with hiatal hernias may also be asymptomatic. This anatomic variant case presents a massive Type IV hiatal hernia with the abdominal contents of the stomach and portions of greater and lesser omentums into the right thoracic cavity. During routine cadaver dissection in an anatomy lab course for first-year medical students, a large hiatal hernia was identified on the right side of the thoracic cavity in an 84-year-old female cadaver (Figure 1) The hernia included 100% of the stomach, pyloric sphincter, and portions of the greater and lesser omentums. As a result, the diaphragm was displaced superiorly. The esophageal hiatus extended from vertebral column levels T8-T12. The hiatus measured 4.3 cm at the circuit between the crural edges and 8.3 cm from the crural commissure to the most superior point of the hiatus. The left crus measured 8.0 cm and the right crus measured 7.2 cm, and the distance between the crura at the crural commissure measured 1.3 cm (Figure 2). The cadaver outlined in this case report died from cardiac arrest. Prior to death, the presence of the large hiatal hernia was known, but no there were no descriptions of significant functional abnormalities. There were no reports of postprandial symptoms or past treatments for the hiatal hernia. However, there was a history of coronary artery disease and gastrointestinal bleeding, which may have been related to the hernia. 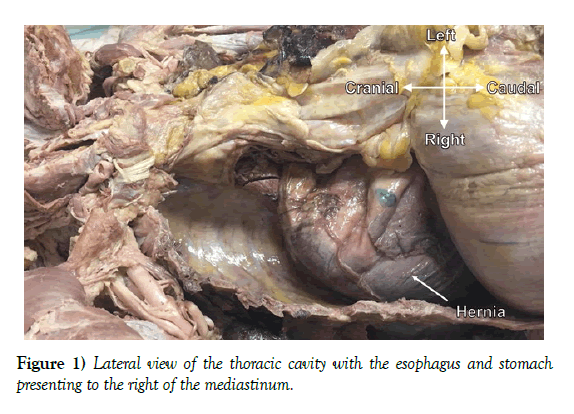 Figure 1: Lateral view of the thoracic cavity with the esophagus and stomach presenting to the right of the mediastinum. Figure 2: Anterior, left-rotated view of the massive esophageal hiatus with a red pin placed in the center for visibility. The herniated contents have been removed and the diaphragm displaced superiorly for visibility and measurement of the hiatus. We believe this case to be a rare variant due to two factors: the size of the esophageal hiatus and the displacement of the hernia to the right side of the thoracic cavity. In a prospective study involving fifty cadavers wherein the GEJ was intra-abdominal and the donors had died of problems unrelated to gastroesophageal reflux disease, the HSA was measured to be 5.84 cm2 . The hiatal surface area (HSA) in this case report was calculated to be 17.41 cm2, which is almost three times the established average HSA in normal patients . Researchers classify such cases as massive hiatal hernias if greater than 50% of the stomach has been displaced into the mediastinum . This particular case fulfills this criterion and qualifies as a massive hiatal hernia. Additionally, the location of the hernia in this case report can be considered rare. Through our literature review, only one case report was discovered outlining three right-sided hernias thought to be congenital in origin . These are found to have better prognosis and often are not discovered until later in childhood because of early asymptomatic presentations. However, chronic symptoms often can develop due to pressure on the hiatal ring . Another pediatric case report noted congenital hernia through other diaphragmatic foramina . Up to 90% of such hernias are noted to be left-sided through the foramen of Bochdalek, whereas right -sided hernias through the foramen of Morgagni are far less common than the former . A study analyzing the laparoscopic repair of giant paraesophageal hernias found that the repair of giant PEHs determined a favorably low rate of symptom recurrence (9.9%), but also with a high rate of anatomic recurrence rate (34.2%) . Regarding the management of PEH, while surgery is indicated in acute symptomatic cases, there are different schools of thought regarding the necessity of surgical intervention for chronic asymptomatic cases. However according to Duranceau, massive hiatal hernias, such as the one in this case report, should undergo elective repair due to the possibility of exacerbating symptoms and unforeseen complications . Looking forward, we believe that there is great scope for future research specific to right-sided hernias and the improvement in quality of life for those who undergo elective surgery. 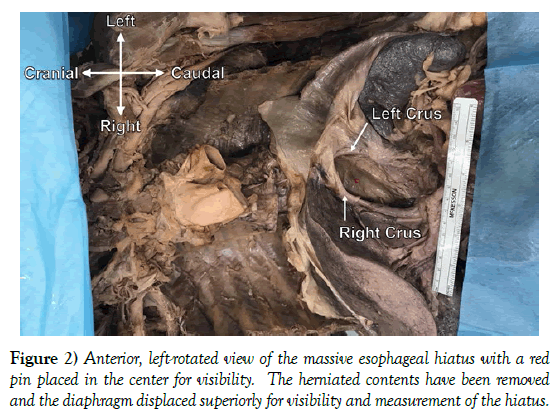 It is interesting to consider that the cadaver in this case study was relatively asymptomatic despite such a large hernia in the right thoracic cavity. This poses questions regarding whether this hernia was of congenital origin and if right sided hernias do have better prognoses, as Haddad suggested. If the latter is true, this further poses the question whether surgery would be indicated to the same extent as left sided hiatal hernias. With this case report, we aim to add to the scarce literature regarding right sided hiatal hernias to begin to answer such questions. The authors would like to express their immense appreciation to the donors for their generous and invaluable gift to the Center of Anatomical Sciences Willed Body Program at the University of North Texas Health Science Center. Kahrilas PJ, Kim HC, Pandolfino JE. Approaches to the diagnosis and grading of hiatal hernia. Best Prac Res Clin Gastroenterol. 2008; 22:601-16. Watson TJ, Moritz T. Hernia, Sliding (Paraesophageal). StatPearl. 2018. Duranceau A. Massive hiatal hernia: a review. Dis Esophagus. 2016;29:350-66. Shamiyeh A, Szabo K, Granderath FA, et al. The esophageal hiatus: what is the normal size? Surg Endosc. 2010;24:988-91. Granderath FA. Measurement of the esophageal hiatus by calculation of the hiatal surface area (HSA). Why, when and how? Surg Endosc. 2007; 21:2224-5. Haddad MC, Youssef BA, Sammak BM, et al. Right intrathroacic stomach secondary to congenital hiatal hernia and organoaxial torsion. Am J Roentgenol. 1996;167:66-8. Kaptanoglu M, Dogan K, Cevit O, et al. Right-sided hiatal henia of the oesophagus. Scand Cardiovasc J. 1999;33:54-6. Antiporda M, Veenstra B, Jackson C, et al. Laparoscopic repair of giant paraesophageal hernia: are there factors associated with anatomic recurrence? Surg Endosc. 2017;32:945-54.